Dr. Sammy Marle, a Lansdown GP, and his friends were quietly playing their usual Saturday night game of bridge when suddenly they heard a plane go over. Marle exclaimed "That's a Hun", then came a bang, "and that's a bomb!". With that the sirens sounded, so we hastily said goodnight and crept into Levis' car to take us home (Admiral Hughes, John Levis and myself). A couple of bombs fell by the Midland Station as we went by. Queen Square was full of people in night array going into a shelter. Then two more bombs rather close went off behind my consulting room (somewhere in Circus Mews) as we turned to pass No 19 Circus. And the High School seemed well alight as we passed it by. The roads were already crackling with glass as we went up the hill. And then some 40 yards above Lansdown Place East, we ran out of petrol. John refilled from a tin in the back while a Hun plane flew over machine-gunning and cannon firing wildly about. Nothing came near us - I had switched out our lights! And then crash went another bomb just in front of Lansdown Place East . The blast was a distinct shock, though the explosion was on the other side of the terrace; and so with that, off we sailed again. After we dropped Hughes at his home we carried on up the hill, where I found the family ensconced in the "strong spot" of the house and feeling not too cheery about it all. 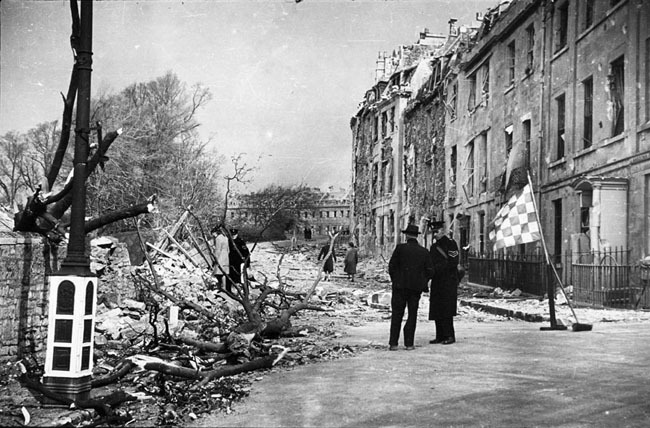 By this time it was evident Bath was taking it in the neck and being undefended, the Hun came down very low to machine-gun roofs and windows and many heavy bombs fell around the lower Weston district - above the Upper Bristol Road, Gas Works, Stothert's etc. And somewhere about 2 a.m. the Hun went home. 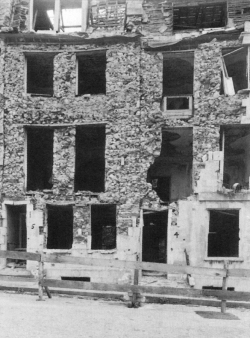 Lansdown Place East suffered quite a bit of damage from the bomb that Dr Marle mentioned. This picture shows the frontage to numbers 4 and 5. The picture below is a more general view of the Lansdown Road end of Lansdown Place East. Notice the white paint on the lamp post to make it more visible in the blackout. Also notice the chequered flag which identifies a Civil Defence reporting point. The sergeant of the Police Specials, in the background of the picture below, talking to the lady, is Sergeant Chorley, the father of Cynthia. There is a picture of the shelter in Queen Square that Dr Marle mentioned, in the Preparations section. The picture there shows it being constructed. What Dr Marle refers to as Midland Station is more commonly known as Green Park Station. It was the Bath terminus of the Midland Railway.